In my day job as a clinical psychologist I am reminded often of the importance of mindfulness meditation practice in fostering mental and emotional well-being. Mindfulness practice as an intervention to promote mental health pervades the field these day, and I recommend it to many of my clients. But, what is “mindfulness?” Definitions vary somewhat, but generally it is about being aware of what is happening in the present moment without judgment – the ability to live in the here and now. It involves paying attention on purpose to things as they are moment-by-moment. Mindfulness meditative practices vary from focused breathing to body scans to walking meditation to mindful yoga and many other approaches. These meditative practices train the ability not only to be present but also to recognize a distracting thought, identify it non-judgmentally and come back to the present moment. As with any training process, more practice yields more skill in staying present in any given circumstance. Aikido is a mindfulness training process. In Aikido practice it is important to concentrate purposefully on every element of a technique, especially during the first few hundred repetitions of the technique. An early-stage student, or even a more experienced student, trying to learn an unfamiliar technique is likely to have distracting thoughts, such as “which foot goes where? or “I’m not doing it right” or “this is embarrassing” or any number of other thoughts taking attention away from focusing on performing every element of the technique. This is not unlike the novice meditator who finds it difficult to stay focused on the meditation process. But over time, with practice both the meditator and the Aikido practitioner gain the ability to recognize a distracting thought and come back to the present moment. They are able to stay in the moment for a greater percentage of the time. 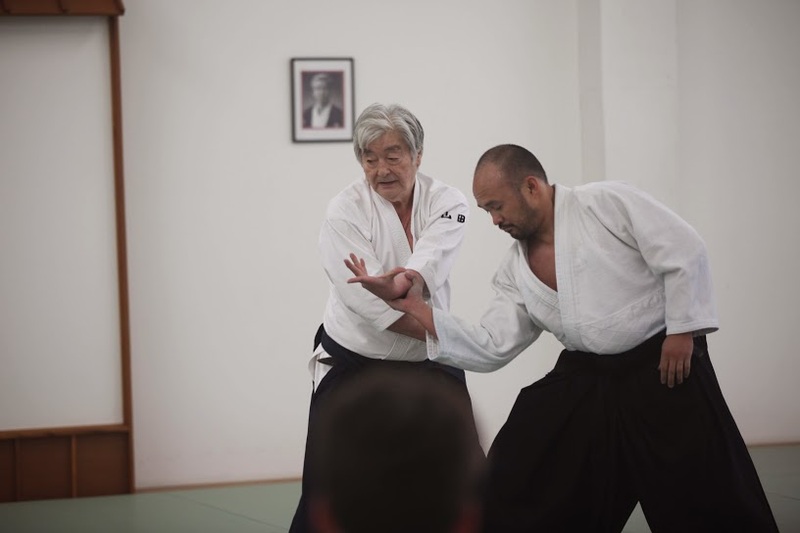 And,like the highly experienced meditator, the long-time Aikido practitioner gets into the “flow” of the technique with little effort to consciously focus on the process. This is the application of mindfulness in practice. Practicing mindfulness through Aikido has the added element of the martial context. In Aikido partner practice both partners have a role in ensuring that the process is safe. Moving incorrectly by either partner may increase the vulnerability to injury; thus, the need for mindful focus is intensified. As I mentioned in a previous blog article, Aiki weapons partner practice adds even further intensity to the training. This increased intensity through martial practice may accelerate the acquisition of mindfulness skills. Mindfulness training in Aikido practice and its application transfers to life outside the dojo. The ability to focus on the task at hand without succumbing to interrupting thoughts is advantageous to many aspects of everyday life – work, relationships, etc. In my own work-life as a psychotherapist, this training facilitates my ability to focus on my client’s words and to recognize quickly when my mind wanders and return to respectful listening. The skill of focused, respectful listening is advantageous to all of our relationships. And this is only one benefit conferred by mindfulness training through the practice of Aikido.